Ever seen someone speaking from stage about the “path to success”? They always seem SOOOO certain. But it’s not just from stage, it’s online as well…. Yesterday a sponsored post on Facebook caught my attention, it was talking about using “story” to cut through the noise online. It’s the *one way* the post assured me to be successful online. Now don’t get me wrong, I love a good story (I’m telling one right now!) but it’s not the only way to get results. #1: As humans most of us crave one thing: Certainty. Even people who love their life to be crazy and out of control are after certainty – for them crazyness and change IS certainty and what feels comfortable for them. So when someone presents the *one way* it gives us certainty, which makes us feel good, and more importantly leads to the second reason it gets used…. #2: It means we’re MORE likely to take action and get results. The downside of this approach though is that it doesn’t show you the BEST way for you to get results. Instead it shows you a way that could work, but it’s not customised for you, or specific to your situation. So what’s the solution for this flaw? The answer for this challenge is to design a specific plan suited to you and YOUR situation. That’s why Kim and I run events or programs with small groups, so that we have time to get to know you and make sure that YOU get the best plan for you to move forwards. 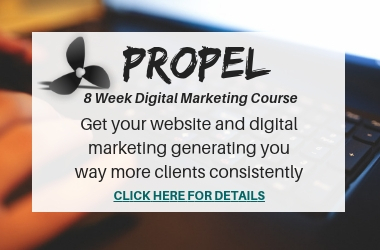 Kim is running a brand new online course called PROPEL Digital Marketing Course and during this 6 week course not only will she give you a stack of specific strategies that will be customised for your business, but she will also support and guide you to implement them! If you want to get your digital marketing for the second half of the year sorted join her for this interactive online course click here for full details.